Arsenic: Mineral information, data and localities. Tin-white, tarnishing to dark grey or black. Name of early origins from the Greek αρσενικόν ("arsenikon"), "masculine", alluding to its potent properties. The Oxford English Dictionary lists the first record of the word "arsenic" in a 1310 book concerning orpiment de iiij libris de orpiment venditis, of unknown authorship. 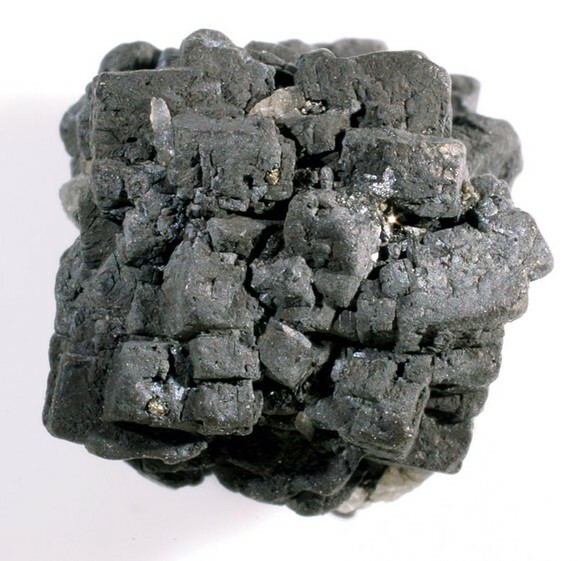 A metallic, steel-gray, brittle element. 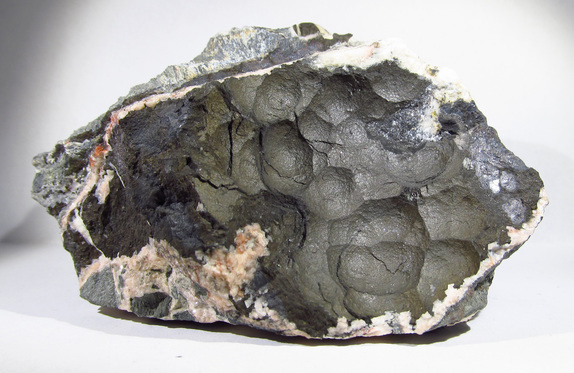 Oxidises slowly in air and is then covered with a thin crust of tiny arsenolite crystals. Used in bronzing, pyrotechny, insecticides, and poisons, and as a doping agent in transistors. Gallium arsenide is used as a laser material to convert electricity directly into coherent light. Arsenic and its compounds are poisonous. Graph shows reflectance levels at different wavelengths (in nm). Top of box is 100%. Peak reflectance is 57.5%. Granular, massive, concentric layered. Reticulated, reniform, stalagtitic, columnar, acicular. small rhombohedra. Quartz 177 photos of Arsenic associated with Quartz on mindat.org. Realgar 168 photos of Arsenic associated with Realgar on mindat.org. Silver 116 photos of Arsenic associated with Silver on mindat.org. Sphalerite 63 photos of Arsenic associated with Sphalerite on mindat.org. Proustite 51 photos of Arsenic associated with Proustite on mindat.org. Calcite 40 photos of Arsenic associated with Calcite on mindat.org. Galena 35 photos of Arsenic associated with Galena on mindat.org. Dyscrasite 28 photos of Arsenic associated with Dyscrasite on mindat.org. Chalcopyrite 27 photos of Arsenic associated with Chalcopyrite on mindat.org. Arsenolite 26 photos of Arsenic associated with Arsenolite on mindat.org. Safety precautions: Wash hands after handling. Avoid generating and inhaling dust when handling, breaking, grinding or cutting. Never lick or ingest. Oral lethal dosis ld50 between 100 and 300mg/kg, so it is not much of a threat compared to some other arsenic compounds. Hoffmann, C.A.S. (1789) Mineralsystem des Herrn Inspektor Werners mit dessen Erlaubnis herausgegeben von C.A.S. Hoffmann. Bergmännisches Journal: 1: 369-398. Broderick, Ehret (1931) Journal of Physical Chemistry: 35: 3322. Palache, C., Berman, H., Frondel, C. (1944) The System of Mineralogy of James Dwight Dana and Edward Salisbury Dana Yale University 1837-1892, Volume I: Elements, Sulfides, Sulfosalts, Oxides. John Wiley and Sons, Inc., New York. 7th edition, revised and enlarged, 834pp. : 89, 128-130. Schiferl, D., Barrett, C.S. (1969) The crystal structure of arsenic at 4.2, 78 and 299 K. Journal of Applied Crystallography: 2: 30-36. Anthony, J.W., Bideaux, R.A., Bladh, K.W., Nichols, M.C. (1990) Handbook of Mineralogy, Volume I. Elements, Sulfides, Sulfosalts. Mineral Data Publishing, Tucson, AZ, 588pp. : 24. The following Arsenic specimens are currently listed for sale on minfind.com. ⓘ Admiral Hill Mine ? Ravensgate Mining Consultants (2007), Independent Technical Report for the Laverton Gold Project Western Australia for Cresecent Gold Ltd, 11/06/2007, Focus Minerald Ltd (2014-2015 drilling campaign) hot copper thread 01/05/2015. Focus Minerals Ltd (2015) Admiral Hill Exploration: Exciting Evidence of VHMS System, Australian Stock Exchange (ASX Announcement 1 May 2015). Friml, J. (2012): Das Fahlerzvorkommen „Schirlgurken" im Krumpengraben bei Hafning. MHVÖ-Aktuell 21, 9-11. Thompson J.E. (1943) Mineral Occurrences in the North Hastings Area, Ontario Department of Mines, Annual Report ARV52, Pt.3, p.16. Moorhouse W. W. (1942) The Northeastern Portion of The Timagami Lake Area, Fifty - First Annual Report Of The Ontario Department Of Mines, ARV 51, Pt. 6, Pg 26. Patterson, G.C. (1984) Ontario Geological Survey miscellaneous paper 118.; Econ Geol (1997) 92:569-577; HARRIS, D.C., ROBERTS, A.C. & CRIDDLE, A.J. (1989): Vaughanite (TlHgSb4S7), a new mineral from the Hemlo gold deposit, Hemlo, Ontario, Canada. Mineralogical Magazine 53, 79-83. Miller Willet. G. (1907): Cobalt - Nickel Arsenide and Silver, Chapter 1; Sixteenth Annual Report of The Bureau of Mines; Vol. 16, Pt. 2, Pg. 11. EVANS, N.N. (1903) Native arsenic from Montreal. American Journal of Science, Series 4, Vol. 15, 92-93. Cortés J.L. ; "Informe sobre mine Recuperada"; CCM-Sernageomin; Stgo de Chile. R.Parker/R.Salas/G.Pérez (1963); "Geología del los distritos mineros de Checo de Cobre, Pampa Larga y Cabeza de Vaca"; Instituto de Investigaciones Geológicas de Chile, Stgo de Chile; Samples analysed by Tony Kampf of LAC Mineralogical Museum, USA; Kampf, A. R., Mills, S. J., Housley, R. M., Rossman, G. R., Nash, B. P., Dini, M., & Jenkins, R. A. (2013). Joteite, Ca2CuAl [AsO4][AsO3 (OH)] 2 (OH) 2· 5H2O, a new arsenate with a sheet structure and unconnected acid arsenate groups. Mineralogical Magazine, 77(6), 2811-2823. Tartakowsky A. (1928): "Descubridora o Carrizo, Departamento de Huasco"; informe preliminar: Caja de Crédito Minero, Vallenar, Chile. A.Gutiérrez S; "Informe sobre visita a la mina de Arsenico nativo de Torrecilla; Instituto de Investigaciones Geológicas, Iquique, Chile, 1975; Samples analysed by Anthony Kampf, Curator Emeritus of LAC Mineralogical Museum, California; Kampf, A.R., Nash, B.P., Dini, M., Molina Donoso, A.A. (2016): Chongite, Ca3Mg2(AsO4)2(AsO3OH)2·4H2O, a new arsenate member of the hureaulite group from the Torrecillas mine, Iquique Province, Chile. Mineralogical Magazine, 80, (in press). Zhiwei Bao, Zhenhua Zhao, Guha, J., and Williams-Jones, A.E. (2004): Geochemical Journal 38, 363-381. Ondruš, P. & Hyršl, J. (1989): New finds and revision of secondary minerals from Příbram district. 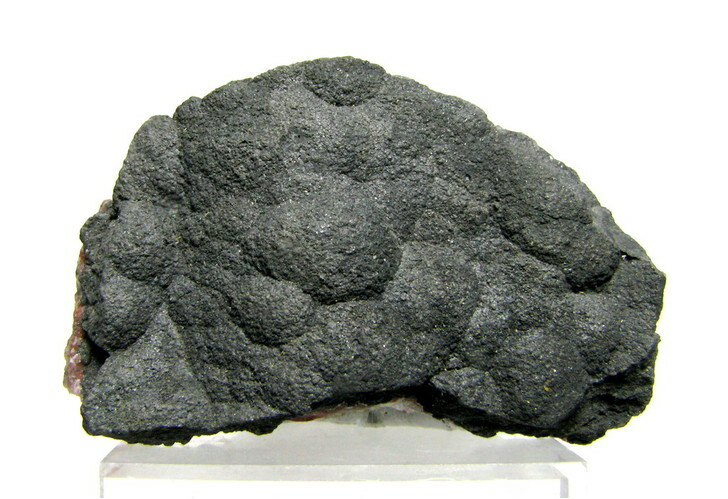 Acta Universitatis Carolinae, Geologica 1989, 521-533.; Josef Vajdak, Pequa Rare Minerals, based on data from Czech geol. Survey, Prague. Pavel Skacha specimen; Sehrig, M. & Dietel, J. (2011): Silber, Uran, Arsen und Heilquellen: Auf Mineraliensuche in Jáchymov, einem der ältesten Bergwerke der Welt. Lapis 36 (7-8), 67-71; 86. Zachariáš, J., Pudilová, M., Žák, K., Morávek, P., Litochleb, J., Váňa, T., Pertold, Z. (1997) P-T conditions, fluid inclusions and O, C, S isotope characteristics of gold-bearing mineralizations within the Central Bohemian Metallogenic Zone. - Acta Univ. Carolinae – Geologica, 41 (3-4), pp. 167–178. ; Lapis 2000(4), 13-30. Picot, P. and Johan, Z. (1977). Atlas des Minéreaux Métalliques, BRGM, Elsevier. Berbain, C., Favreau, G. & Aymar, J. (2005): Mines et minéraux des Pyrénées-Orientales et des Corbières, Association Française de Microminéralogie Ed., 26. Companyo, L. (1861): Histoire naturelle des Pyrénées-Orientales, Imprimerie de J.-B. Alzine, Tome I, 353. Orlandi P., Campostrini I. (2005): Zibaldone. Aggiornamento di mineralogia Italiana 2004. Riv. Mineral. Ital., 29, 3 (3-2005), 184-192; Piccoli G.C., Maletto G., Bosio P., Lombardo B. (2007). Minerali del Piemonte e della Valle d'Aosta. Associazione Amici del Museo "F. Eusebio" di Alba, Ed., Alba (Cuneo), 607 pp. Froment A. (1899): Rapport sur les Mines de Tavagnasco. Tipografia L. Garda, Ivrea, 55 pp. ; Piccoli G.C., Maletto G., Bosio P., Lombardo B. (2007): Minerali del Piemonte e della Valle d'Aosta. Associazione Amici del Museo "F. Eusebio" di Alba, Ed., Alba, 607 pp. Froment A. (1899): Rapport sur les Mines de Tavagnasco. Tipografia L. Garda, Ivrea, 55 pp. De Castro, C. (1890) Descrizione geologico-mineraria della zona argentifera del Sarrabus (Sardegna). Memorie descrittive della Carta geologica d'Italia, 5, 68 pp. + 6 plates + 1 folded geological map; Traverso, G.B. (1898) Sarrabus e suoi minerali. Note descrittive sui mineralidel Sarrabus facenti parte della collezione di minerali italiani presso il Museo civico di Genova. Tipografia e Libreria Sansoldi, Alba, 73 pp. Stara, P., Rizzo, R. & Brizzi, G. (1993). Sarrabus. Miniere e minerali. Associazione Mineralogica Sarda, Gruppo Mineralogico Lombardo, Associazione Piemontese Miner. Paleont. e Mostra Torinese Minerali, Centro Mineralogico Varesino, Amici Mineralogisti Fiorentini, Gr. Mineral. Paleont. Piacentino, Gr. Mineral. Cremonese, Gr. Liguria, 210 pp. De Castro, C. (1890) Descrizione geologico-mineraria della zona argentifera del Sarrabus (Sardegna). Memorie descrittive della Carta geologica d'Italia, 5, 68 pp. + 6 plates + 1 folded geological map; D'Achiardi, G. (1896) Museo di Mineralogia della R. Università di Cagliari. Bollettino della Società Geologica Italiana, 15, 471-474. De Castro, C. (1890) Descrizione geologico-mineraria della zona argentifera del Sarrabus (Sardegna). Memorie descrittive della Carta geologica d'Italia, 5, 68 pp. + 6 plates + 1 folded geological map; Traverso, G.B. (1898) Sarrabus e suoi minerali. Note descrittive sui minerali del Sarrabus facenti parte della collezione di minerali italiani presso il Museo civico di Genova. Tipografia e Libreria Sansoldi, Alba, 73 pp. ; Stara, P., Rizzo, R., Brizzi, G. (1993) Sarrabus. Miniere e Minerali. Associazione Mineralogica Sarda, Gruppo Mineralogico Lombardo, Associazione Piemontese Mineralogia Paleontologia e Mostra Torinese Minerali, Centro Mineralogico Varesino, Amici Mineralogisti Fiorentini, Gruppo Mineralogico Paleontologico Piacentino, et al., Stige Milano Srl, Milano, 208 pp. Traverso, G.B. (1898) Sarrabus e suoi minerali. Note descrittive sui mineralidel Sarrabus facenti parte della collezione di minerali italiani presso il Museo civico di Genova. Tipografia e Libreria Sansoldi, Alba, 73 pp. ; Stara, P., Rizzo, R., Brizzi, G. (1993) Sarrabus. Miniere e Minerali. Associazione Mineralogica Sarda, Gruppo Mineralogico Lombardo, Associazione Piemontese Mineralogia Paleontologia e Mostra Torinese Minerali, Centro Mineralogico Varesino, Amici Mineralogisti Fiorentini, Gruppo Mineralogico Paleontologico Piacentino, et al., Stige Milano Srl, Milano, 208 pp. National Science Museum, Tokyo, displayed specimen #227. Matsubara, S. et al (2001) Mineralogical Magazine, 65, 807-812. Dr. Kameki Kinoshita collection (curated at Geological Survey of Japan); Kamitani, M., Okumura, K., Teraoka, Y., Miyano, S., and Watanabe, Y. (2007): Mineral Resources Map of East Asia. Geological Survey of Japan. Breward, N., & Williams, M. (1994). Preliminary Apparaisal of the Environmental Geochemistry of the Bau Mining Area, Sarawak, Malaysia. British Geological Survey. ; Wolfram Dieter Schuh (1993) Geology, Geochemistry, And Ore Deposits Of The Bau Gold Mining District, Sarawak, Malaysia. PhD Thesis University of Arizona. DILL, H.G. and HORN, E.E. (1996) The origin of a hypogene sarabauite-calcite mineralization at the Lucky Hill Au-Sb mine Sarawak, Malaysia.- Journal of Southeast Asian Earth Sciences, 14: 29-35; Breward, N., & Williams, M. (1994). Preliminary Apparaisal of the Environmental Geochemistry of the Bau Mining Area, Sarawak, Malaysia. British Geological Survey. Auckland Star newspaper (1915) Goldmining at Coromandel, Vol. XLVI, issue 119, 20 May 1915. Cox, S.H. (1981) Notes on the mineralogy of New Zealand. Transactions of the New Zealand Institute 14: 418-450. Railton, G.L¹., Watters, W.A. (1990) Minerals of New Zealand. New Zealand Geological Survey Bulletin 104, 89 pages. (¹published as G.L. Railton but his initials should be G.T. not G.L. - Errata sheet inserted in publication). Simpson, M.P., Mauk, J.L., Merchant, R. (2011) Bonanza grade epithermal veins from the Coromandel and Thames districts Hauraki Goldfield, Proceedings 2011 AusiMM New Zealand branch annual conference, 27-30 August 2011, Queenstown, New Zealand. Cronstedt 1758, Brünnich 1777, p. 77, Neumann 1985, p. 9. Pieczka, A.; Grew, E.S. ; Groat, L.A.; Evans, R.J. (2011): Holtite and dumortierite from the Szklary Pegmatite, Lower Silesia, Poland. Mineralogical Magazine 75, 303-315.; Pieczka, A., Evans, R. J., Grew, E. S., Groat, L. A., Ma, C., & Rossman, G. R. (2013). The dumortierite supergroup. II. Three new minerals from the Szklary pegmatite, SW Poland: Nioboholtite,(Nb0. 6⃞0. 4) Al6BSi3O18, titanoholtite,(Ti0. 75⃞0. 25) Al6BSi3O18, and szklaryite, ⃞Al6BAs33+ O15. Mineralogical Magazine, 77(6), 2841-2856. Azevedo and Calvo, 1997; Ascenção Guedes, 2002, The Mineralogical Record, January-February 2014, Volume 45, Number 1, (Carlos Curto Milà and Jordi Fabre, pages 11-55). Dion Glastra specimen; Grancea, L., Bailly, L., Leroy, J., Banks, D., Marcoux, E., Milési, J., ... & Fabre, C. (2002). Fluid evolution in the Baia Mare epithermal gold/polymetallic district, Inner Carpathians, Romania. Mineralium Deposita, 37(6-7), 630-647. Terleev, A. A., Simonov, V. A., Kanygin, A. V., Tokarev, D. A., Stupakov, S. I., & Kotlyarov, A. V. (2014). Unique location of hydrothermal biota in the Lower Cambrian sedimentary-volcanogenic complex of the Kyzyl–Tashtyg ore field (Eastern Tuva). Russian Geology and Geophysics, 55(1), 54-61. Pavel M. Kartashov data; Vikent'eva, O., & Vikentev, I. (2016, April). Occurrence modes of As, Sb, Te, Bi, Ag in sulfide assemblages of gold deposits of the Urals. In IOP Conference Series: Materials Science and Engineering (Vol. 123, No. 1, p. 012028). IOP Publishing. ; Vikentyev, I. V., & Vikentyeva, O. V. (2015). Precious metal minerals and “invisible” gold in sulfide ores of Urals. In Mater. of ХII Int. Sci. Conf.“Advanced Technologies, Equipment and Analytical Systems for Materials and Nano-Materials (Vol. 3, pp. 33-41). ; Kasatkin, A.V., Makovicky, E., Plášil, J., Škoda, R., Agakhanov, A.A, Karpenko, V.Y. and Nestola, F. (2018) Tsygankoite, Mn8Tl8Hg2(Sb21Pb2Tl)S24S48, a New Sulfosalt from the Vorontsovskoe Gold Deposit, Northern Urals, Russia. Minerals: 8(5): 218. Slobodan A. Radosavljević, Jovica N. Stojanović, Aleksandar M. Pačevski, Hg-bearing sphalerite from the Rujevac polymetallic ore deposit, Podrinje Metallogenic District, Serbia: Compositional variations and zoning, Chemie der Erde - Geochemistry, 72, 2012, 237-244; Radosavljević, Slobodan A.; Stojanović, Jovica N.; Radosavljević-Mihajlović, Ana S.; Vuković, Nikola S. (2014): Rujevac Sb-​Pb-​Zn-​As polymetallic deposit, Boranja orefield, Western Serbia: native arsenic and arsenic mineralization. Mineralogy and Petrology 108, 111-122. Stalder, H. A., Wagner, A., Graeser, S. and Stuker, P. (1998): "Mineralienlexikon der Schweiz", Verlag Wepf & Co. (Basel), p. 51; Meisser, N. (2012): La minéralogie de l'uranium dans le massif des Aiguilles Rouges. Matér. Géol. Suisse, Sér. géotech. 96, 183 p.
Hall, T.M. (1868): Edward Stanford (London), 168 pp. ; Hill, J.B., MacAlister, D.A., and Flett, J.S. (1906): The geology of Falmouth and Truro and of the mining district of Camborne and Redruth. HSMO Publications (London), 335 pp. Dines, H.G. (1956): The metalliferous mining region of south-west England. HMSO Publications (London), Vol. 1, pp. 282-284. Reid, C., Flett, J.S., Wilkinson, B.S.N., Dixon, E.E.L., Pollard, W., and MacAlister, D.A. (1907): The Geology of the Land's End District. HMSO Publications (London), p. 100. Schrader, F.C. and J.M. Hill (1915), Mineral deposits of the Santa Rita and Patagonia Mountains, AZ, USGS Bull. 582: 328. Anthony, J.W., et al (1995), Mineralogy of Arizona, 3rd.ed. : 119; Warren, C.H. (1903), Native Arsenic from Arizona, Amer. Jour. Sci. : 16: 337-340; Struthers (1904); Guild, F.N. (1910), The Mineralogy of Arizona, The Chemical Publishing Co., Easton, PA; Schrader, F.C. & J.M. Hill (1915), Mineral deposits of the Santa Rita and Patagonia Mountains, AZ, USGS Bull. 582: 329; Galbraith, F.W. (1947), Minerals of AZ, AZ Bur. Mines Bull. 153: 12. Richthofen, Ferdinand [Baron von] (1865), Die Metall-Produktion Californiens und der angrenzenden Länden: Petermanns Mitt. Erganzungsband III, Erganzung Heft 14, 58 pp. : 46; urdoch, Joseph & Robert W. Webb (1966), Minerals of California, Centennial Volume (1866-1966): California Division Mines & Geology Bulletin 189: 85. Morgan, V. and Erd, R.C. (1969) Minerals of the Kramer borate district, California California Division of Mines and Geology Mineral Information Service: 22(9): 146; Carnahan, V. (1970), Notes on some minerals from Boron: Bulletin of the Mineralogical Society of Southern California, November: 10; Pemberton, H. Earl (1983), Minerals of California; Van Nostrand Reinholt Press: 213. Blake, Wm. P. (1856), Observations on the physical geography and geology of the coast of California, from Bodega Bay to San Diego: US Coast Survey, Report 1855: 301; Blake, Wm. P. (1858), Report of a geological reconnaissance in California 370 pp., New York. : 301; Murdoch, Joseph & Robert W. Webb (1966), Minerals of California, Centennial Volume (1866-1966): California Division Mines & Geology Bulletin 189: 85, 126; Dana 6: 1096; Eakle (1914) Minerals of California. Murdoch, Joseph & Robert W. Webb (1966), Minerals of California, Centennial Volume (1866-1966): California Division Mines & Geology Bulletin 189: 85; Pemberton, H. Earl (1983), Minerals of California; Van Nostrand Reinholt Press: 51. Johnston, William Drumm (1937), Native arsenic from Grass Valley, California: California Division Mines Report 33: 340; Johnston, William Drumm (1940), The gold-quartz veins of Grass Valley, California: USGS PP 194, 101 pp. : 36; Murdoch, Joseph & Robert W. Webb (1966), Minerals of California, Centennial Volume (1866-1966): California Division Mines & Geology Bulletin 189: 85; Pemberton, H. Earl (1983), Minerals of California; Van Nostrand Reinholt Press: 51. R&M 69:3 pp 156-162; AM. MINERALOGIST, V. 18, 335-340. Minerals of Virginia 1990 by R. V. Dietrich; James L. Calver (1962) Geology and Mineral Resources of Albermarle County. Virginia Geological Survey; Bulletin 77.